Since starting Gossamer Tangles in February of 2011, I'd never had my own work space. I had my supplies stored in four different rooms, inside various closets, cupboards, and drawers. Whenever I worked on a project, I had no space where I could leave it out and continue my work. I was always moving from place to place, and trying to find someplace to store my work in progress at the end of the day. After our daughter moved out, Dan, my husband, always used her old bedroom to work in whenever he had a big writing project (he's an appellate attorney). He would set up a card table and the old kid's game table and spread his work out while he listened to music. But again, the space was temporary. When the project ended, the tables had to be put away, lamps moved back to their original places, office supplies removed and the cd player stored away. I am so thankful all that has changed! Over the course of the last few weeks, my husband, Dan, and I transformed my daughter's old bedroom into a work space we can share. It's nothing fancy and would certainly not win any interior design or home decorating awards, but we both have great space to do what we need to do and be comfortable while we're doing it. And as a bonus, we can spend more time together because we both spend a lot of our time working. Betsy's room was the quintessential girl's bedroom. The carpet was a deep mauve pink color. The wallpaper had a cream background with pink and green stripes, and there was a large pink flowered border. She had very feminine looking white bedroom furniture. 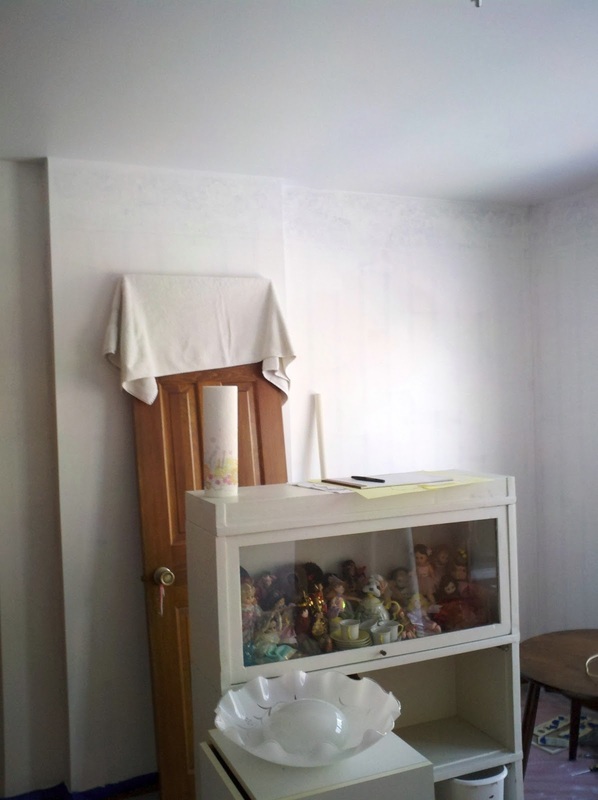 When we started working on the room, we discovered it was absolutely impossible to get the wallpaper off the walls. 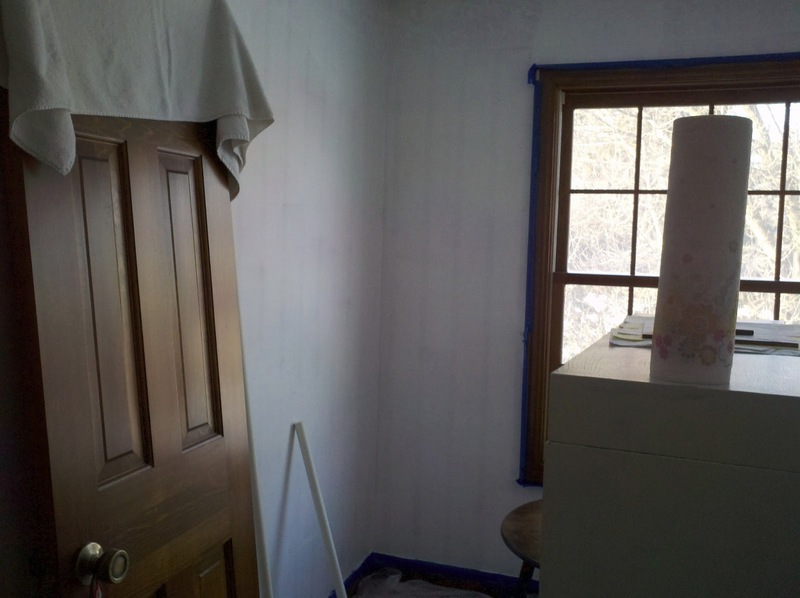 So, we covered them with a vinyl-to-vinyl primer and then hung a new textured wall covering over the old paper. Despite the many warnings against papering over paper, it worked out well and we experienced no problems in the process. Here are some photos of the room as we were starting. 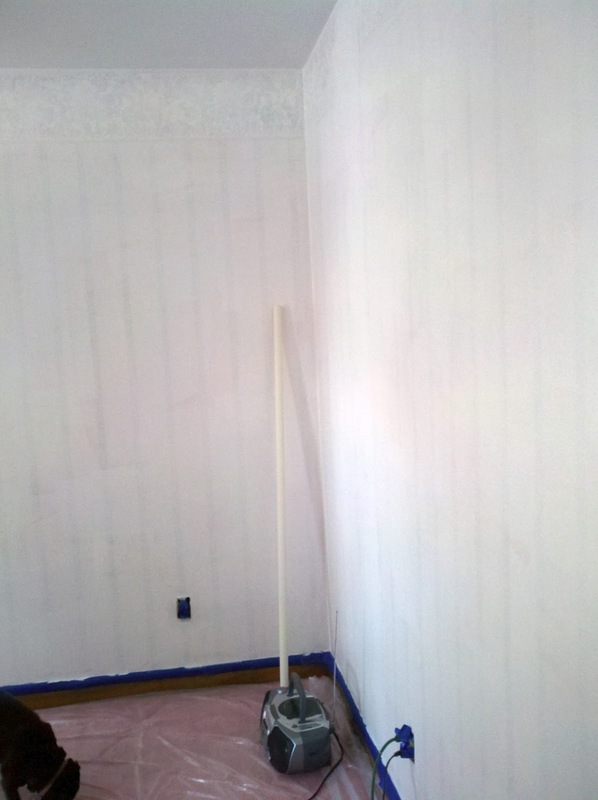 Dan had just put the primer over the wallpaper and you can see the old pink carpet. Then the wallpapering began. Although we worked on this together, Dan was the real pro. Rolling out the air bubbles. The water tray and cutting table. New paper meets old paper. Our pugs, Yue Ying and Logan, had to help out. After the wallpapering was finished, the new carpet was laid. We got it from Lowe's and used their installers. They did a great job and they cleaned up after themselves! Then came the furniture. We purchased a sleeper sofa from Art Van, so that we can use the room as a guest room when needed. We also purchased new desks from Art Van. These are my favorite thing about the new room! 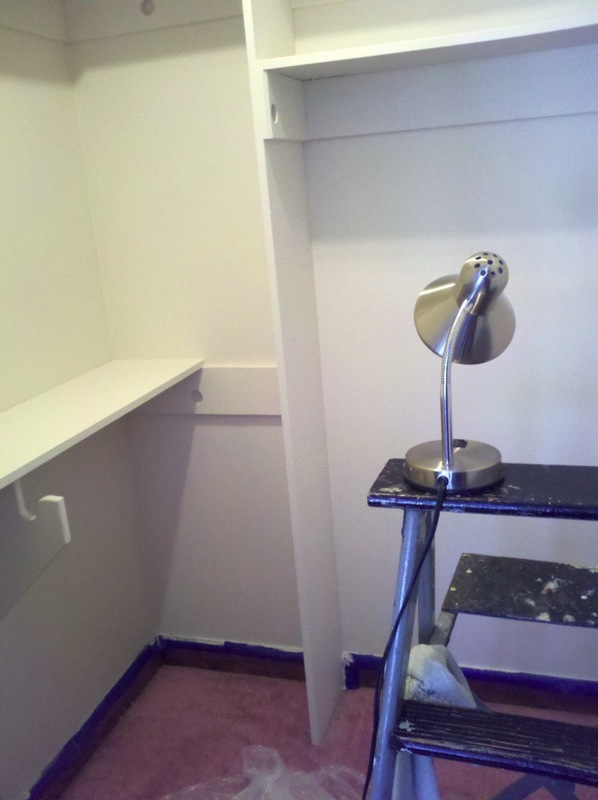 The desks are at a height where you can work standing, or sitting, and they have tons of storage space built in. My desk ... the shelves are filling up. Finally, we added curtains from Target. I like the print. It livens up the room a bit. I ended up crocheting a tie back for the two center panels. Why use a dog bed when you can lay on the comfy couch? My daughter's old pine hutch doesn't match the room very well, but it does provide additional needed storage space. But the shelves under the desk provide great storage space, too. ... like for my threads, including my grandma's old thread box. I am really enjoying the new studio/work space, and so is Dan. I'm sure we'll eventually get some art up on the walls, maybe get a hutch or chest that matches the rest of the room, perhaps someday get a flat screen TV; but for now, its a space we can call our own. It's a space where I can work and create with everything I need at my fingertips, and where I can leave my work at the end of the day and come back to find it the next ... ready and waiting for me. For that, I am deeply thankful!